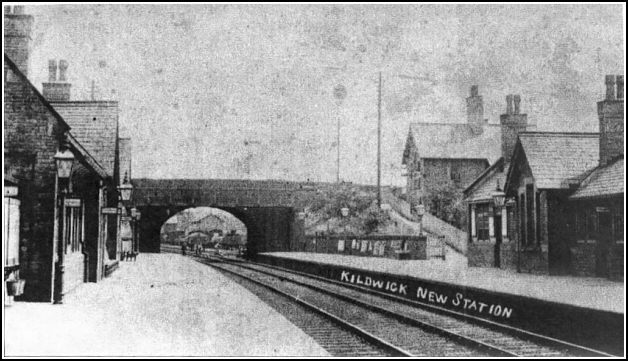 Brenda Parsons sent scans of these two old photographs, one of her great, great grandfather and one of the "new" station at Kildwick. The text accompanying the photograph says, "Jonathan Whiteoak was a well-known local carrier around Glusburn and Sutton. His horse was called 'Vinegar', and without any word of command could always be relied on to stop outside the Old White Bear Inn, knowing full well that this was what was expected of him, 'Vinegar' having been so well trained by his owner. The horse also added to his reputation by being very prone to run off at any moment. Whenever this happened, up went the cry 'Vinegar's risen again'. The photograph was taken at the top of Holme Lane which, in 1900, really was a lane with a very rough surface indeed'." I wonder which end of Holme Lane it refers to? Cross Hills end? 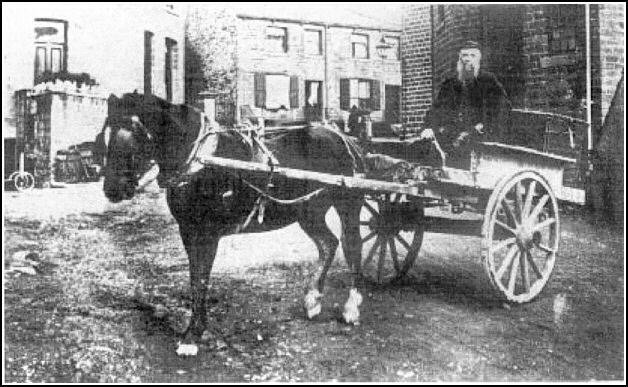 Jonathan is my great, great grandfather and what the photo caption doesn't mention is that my great, great grandmother, Hannah, on many occasions would have to go to and get the inebriated Jonathan out of the pub and onto the cart, and then she'd drive him and the cart back home. Hannah's maiden name was Greenwood. I wonder if any of your readers have her in their family tree. In addition to my grandfather Charles Edward, the children they had were Paulina who married Smith Overend and they had a son called Hubert, Mary Ellen who married John Davy and they had a son called Leonard, Annie who married Arthur William Whitaker and they had a daughter Norah, and Ada Jane who married either Albert Walker or William Edward Dickinson. I'd love to hear from anyone who has any of those people in their family tree. The text accompanying the photograph says, "The station was opened in 1889, and was in use for both freight and passengers until 22nd March 1965. The station was demolished when dry rot was discovered in the building. Beyond the bridge is the Goods Yard, very full of freight. The girder footbridge is still in use today. Notice the fine ornate gas lamps on the platform, and the three waiting rooms on the left: First Class, Ladies and General. The 'cottage' type of architecture used in the building of the station was a favourite method of the Victorian architect when designing small stations in rural areas." When I lived in Sutton in the late 40's the station was very much in use and I remember being frightened to death when the steam trains came thundering in. I was OK while we were standing on the platform waiting for our train to arrive but as soon as I saw it coming down the line with all the smoke bellowing out I would press myself flat against the wall of the station buildings so I wouldn't fall on to the line and under the wheels of the train. I wasn't too happy when it finally stopped either, as then great clouds of steam would come hissing out from underneath the wheels of the engine wrapping everything in a hot, wet fog. Me and my mother would sometimes wait in the Ladies waiting room if it was cold weather as there would usually be a fire blazing in a little cast iron fireplace set into the wall. We would sit on the hard wooden benches which were set against the wall, I would be swinging my legs since they didn't reach the floor, watching the sparks dropping from the burning coal onto the tiled hearth and looking at the posters advertising the delights of seaside towns around the walls. Lots of tin plate adverts were fastened to the walls and railings of the station, ones I particularly remember were for Brylcreem, which I think had a picture of Dennis Compton on it, maybe one of the site's cricketing enthusiasts would know if it was him or not, something called Virol which I think was a kind of pick me up or tonic, where a spoonful a day would keep all manner of things away, and of course Bovril bearing a drawing of a steaming mug of the drink on it and a happy looking cow's face beaming above it and out at you.